"This is how I fix leaks in a basement wall"
Are you SICK AND TIRED of that crack in your basement wall leaking water onto the floor? Today, there's so many crack injection kits out there to choose from, dozens of different brands, and all kinds of inadequate videos and web pages trying to show you how to fix the crack all by yourself. I want the CRACK REPAIR KIT now. Fixing a crack in your foundation wall can seem like a very challenging task to take on. Especially if you don't know what kind of crack repair material to use. Even more confusing is not knowing where to start, even if you did have the right crack repair kit! Someone like a professional who is with you every step of the way to make sure you succeed, it can leave you feeling helpless and intimidated. Basement wall crack repair: diy or not? 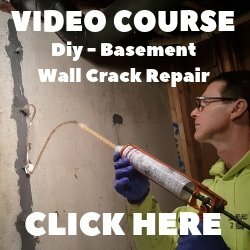 I made this video showing you how to fix a leak in your basement wall so you can determine whether or not you can do this yourself or if you have to hire a professional like me. p.s. "I usually charge $500 dollars per crack to fix these"
If the floor gets wet, there's a good chance anything setting on the floor could get ruined. Or worse, a wet basement could lead to mold, fungus, and mildew growth that would cost you thousands to get rid of. This is my "diy crack repair secret weapon"
That's me injecting the crack with a repair material that fills the crack and expands 20X to completely seal the crack and keep the water out. My company, Day's Concrete Floors, Inc. does foundation crack injection as one of our services to our customers. I can tell you that I have to charge upwards of 500 dollars per crack to fix these leaking cracks. I know, that's a lot of money! I'm a business, I have material costs, labor costs, overhead costs, and I still have to make some profit on top of all that to stay in business. 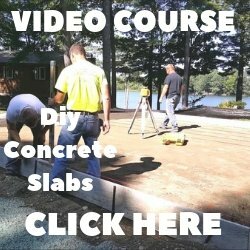 I've been doing concrete work and repairing cracks in concrete for close to 40 years. After fixing hundreds of these cracks I've learned some tips and tricks that make repairing these cracks quite easy that I want to share with you. You can watch the video of me actually fixing a basement wall crack and showing you my tips & trick to easily perform this task. What's my "secret weapon" repair material? 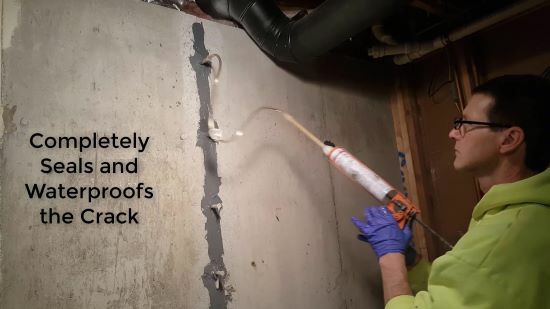 It's called RadonSeal DIY Foundation Crack Repair, it's a diy crack injection repair product that's easy to use and will completely seal your crack, stopping it from leaking. Radonseal's Crack repair has never let me down, It's always sealed any leaking crack I've injected with it. My "SECRET" is that it's so easy to set-up and inject the crack with I really don't want diy's to know. If all you guys know how easy it is to use, you'll stop hiring me. "I'm just kidding" , there'll always be someone who needs a professional to do it, but if you're even a little bit handy around the house I honestly feel like you can complete this project yourself. Why is this crack repair kit diy easy? What makes this foundation repair kit so easy to use? Why is this kit better than others out there? 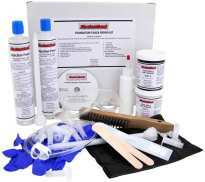 RadonSeal foundation crack repair kits use a two-component injection polymer. It's a proprietary 2-part polyurethane that expands 20 times its volume to fill the entire depth of the crack. This 2-part hydrophobic foam repels water and will not break down over time. Cheaper repair kits use a single-component hydrophilic foam that absorbs water but eventually fails after repeated wetting and drying. One kit like this will repair 8 - 10 lineal feet of 1/16" - 1/8" wide crack. Make sure you order enough to completely seal your crack(s). "I can be right there with you every step of the way." That's right, I'll be right there with you! I made an in-depth TUTORIAL VIDEO, like the one above, of me actually repairing a crack. I explain all the steps in detail and I show them to you as I'm doing them! The best part, what makes this tutorial really valuable, are the tips and tricks I show you as I fix this crack. The kinds of things you learn by doing 100's of these over 35+ years. I normally charge my customers $500.00 per crack when I go to repair them. I'm a business, I have to charge for materials, labor, travel, overhead, and still make a little profit. YOU can hire me for only $15 dollars, of course I'll be on video, but it'll be just like having me there repairing the crack with you. YES, I want your HELP!! And I want save myself a LOT of money!